Sometime after midnight, a troupe of devils was dancing down the Rambla Nova boulevard to the beat of dozens of drums. Swirling sparks showered from the firecrackers stuck onto the iron pitchforks that the devils were twirling above their hooded, horned heads. As a winged dragon lurched towards me, breathing fire, my friend Rafa grabbed my arm and dragged me into the throng. We spun around under the hail of sparks, protected only by our straw hats and old shirts. 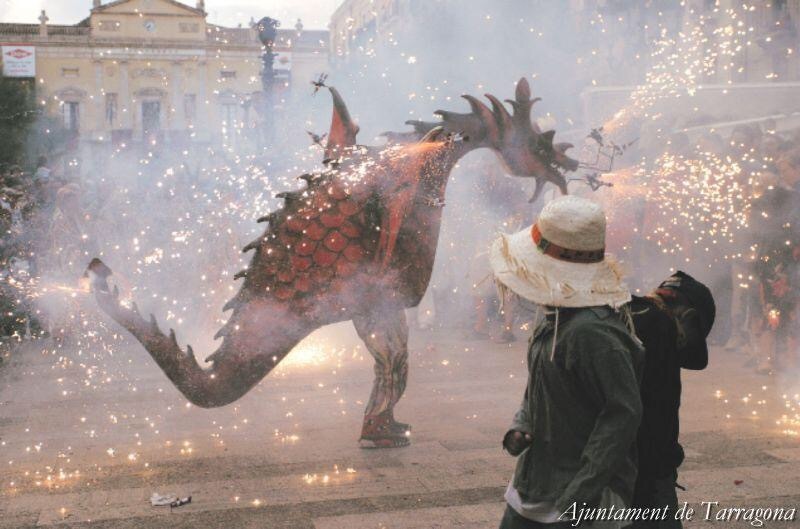 This thrilling if foolhardy experience was part of the Santa Tecla festival, an annual event which takes place in the third week of September in Tarragona and celebrates the city’s patron saint, known in English as Thekla. Although the legend is a bit shaky, the saint was apparently born around 2000 years ago in Iconium, which is now part of Turkey. A teetotal vegetarian, she devoted her life to preserving her chastity. Her enemies tried repeatedly to get rid of her by setting her on fire and getting a variety of beasts to attack her, all to no avail. Like many Spanish festivals, Santa Tecla has been revived since democracy was restored in the last quarter of the 20th century, but dates back to 1321 when a relic of Tecla’s arm was brought to Tarragona cathedral. It remains there to this day, and is paraded through the streets on September 23 every year. Feeling thirsty in the warm sun the next day, I bought a yellow plastic bottle containing a mystery liquid from one of many stalls in the Placa del Font, which was the centre of the city in Roman times and is now the focus of the festival. I took a swig, and immediately realised this was not the innocuous soft drink I had been expecting. “What the hell is this?” I asked Rafa. “It’s a mix of yellow and green Chartreuse with lemon granita,” he replied. No wonder it blew my socks off. “When monks were expelled from France at the beginning of the 20th century, they fled to the Carthusian monastery in Tarragona, and started making Chartreuse there. We drink more of the stuff here than anywhere else in the world,” he added. Looking around the packed square, I could well believe it. Clutching our drinks, we made our way to the stone steps leading up to the cathedral. Human towers, known as castellers and consisting of people standing on each other’s shoulders to form a pyramid, are a feature of festivals throughout Catalunya, but at Santa Tecla they up the stakes a bit. I watched agog as a tightly-packed scrum of strapping blokes quickly formed at ground level. Increasingly slender and nimble climbers, their buttocks firmly cupped by those below, shinned up the tower, gripping with their knees, finding footholds in cummerbunds and rolled-up trouser hems. It took less than a minute before a little girl of just four or five reached the top and raised her arm to signal that the pyramid was complete, with an astonishing nine levels. The trembling formation then started to move, wobbling precariously up the steps to the cathedral and back down again, before shuffling through the main street to the town hall in the Placa del Font, where the little girl at the top was hauled onto the balcony to greet the mayor and other bigwigs. Not for the first time, I wondered what our Health and Safety inspectors would make of it all.